Appearance - Ants vary in size and color depending on the species. All ants have three distinct body parts (head, abdomen, and thorax), as well as two antennae. Behavior - Ant infestations are hard to miss, with hundreds of little ants sprawling all over your sidewalk, yard or even inside your home. Most times, ant infestations also include mounds of anthills or obvious ant colonies within cracks in the sidewalk or near a window or door in your home. While most ants pose no serious physical harm to people on your property, they can cause havoc to your plants, property, and home by existing and being in such mass quantities. Ants are not picky with their food which can range from plant nectar in your yard to and food crumbs left on your floors and in your cabinets. This is why calling us for ant control would be the next step. We will be able to provide ant extermination to the area of your property where the ant colony is located and trace where the ants are coming from once they have entered your home, effectively eliminating the problem. You may have an ant infestation for a multitude of reasons. If you have a lot of sidewalks with cracks near your home, ants may simply have wandered off from their newly acclaimed sidewalk colony and expanded territory into your yard. If you have a property with lots of loose dirt or sand, ants like to formulate colonies there due to the soil being easy to transport for colony formation. Ants that come inside may have sniffed out something in your home such as an open box of cereal or some spilled sugar in a cabinet. An ant exterminator can determine your ants are coming from and where they are headed. We can perform effective ant control and keep the infestation from taking over your property and home. Ants enjoy traveling in packs of hundred or thousands. If you see one or two ants, most likely there are a hundred more waiting to take over your yard or home. Their excavating for ant colonies can make your yard look messy. Ants that have entered your food cabinets can cause costly damage to your groceries. Also, ant problems are less likely to go away on their own without interior and exterior ant treatment. Ensuring all food products are safely sealed and sealing up cracks in your home are first steps you can take to discourage further ant problems. 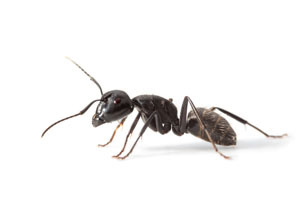 Calling our professional ant extermination team can ensure that successful ant control takes place and that your home and property are ant free.